If you are suffering from teeth that are twisted, crooked, gapped or otherwise misaligned, then our dentist may have spoken to you about orthodontic treatments and what your options are regarding correcting these issues. Most people tend to think of orthodontic treatments purely as a way to improve your appearance, but they can also have a significant benefit on the health of your teeth and mouth. One of the reasons for this is that closing gaps between your teeth can help reduce the likelihood of you experiencing dental decay and periodontal disease. Correcting your bite can reduce pain in your jaw and other symptoms relating to the temporomandibular joint. Conventional braces and Invisalign are the two primary treatments that can correct orthodontic dental problems. While they both work by propelling teeth into new and improved positions so that alignment and the position of your bite is corrected, the treatments themselves are very different. To help you decide which is most suitable for you, here is what you need to know about the differences between Invisalign and Braces. By far the most obvious difference between the two treatments is their design. Orthodontic braces use metal framework, wires, brackets and elastics to move the teeth into their new position. The main part of the brace is attached securely to your teeth using strong adhesive, and the wires and elastics are used to apply force to them to drive them into new and improved positions. Regular adjustments to the brace are made at each stage of the treatment, each directing the teeth in a specific way so that eventually, they end up in the desired locations. In contrast, Invisalign uses a series of custom-designed aligners that sit over the top of the teeth. They have been made in such a way that they also exert pressure onto the teeth to guide them into a new position. However, there are no adjustments that need to be made. The patient simply moves on to the next aligner in the series. Each is worn for at least 22 hours per day for approximately 2-3 weeks (as directed by our provider), working your way through the entire series. By the time you reach the end, your teeth should be in their new and improved position. One of the biggest disadvantages of regular braces is that there is simply no way to hide them. Sure, you can smile with your mouth closed, but you cannot avoid eating and speaking in public forever. People who wear braces can feel self-conscious or embarrassed about the appearance of their teeth while they are wearing braces. Fortunately, Invisalign aligners are made from transparent plastic. This enables them to be virtually invisible once they are in place over your teeth. 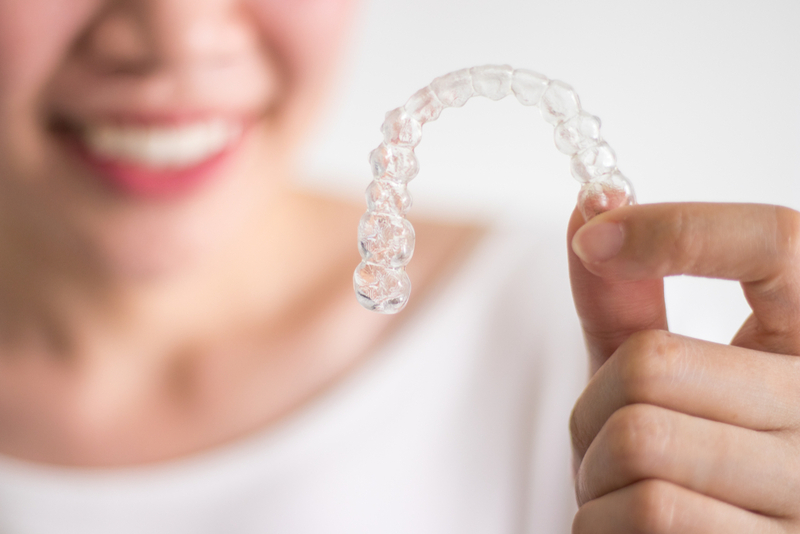 Patients who opt for Invisalign often report much greater confidence in their smile while their treatment is taking place. Braces aren’t the easiest thing to wear, especially when you are trying to eat. There are certain foods that your dentist will almost certainly recommend that you should avoid because they can get stuck in, or damage, your brace. They include items such as toffees, popcorn, chewing gum and even some tougher meats. However, since Invisalign aligners can be removed for very brief periods such as eating, you can enjoy whatever foods you like before popping your aligner back in. Again, since braces cannot be removed, negotiating the metalwork, wires and elastics to comprehensively brush and floss your teeth is extremely difficult. This often means that areas are not cleaned properly, putting you at risk of tooth decay and periodontal disease. In contrast, Invisalign aligners can and should be removed daily to clean both them and your natural teeth. No tricky framework to get around means that you can do a very thorough job of brushing and flossing. Unsurprisingly, this is a contributing factor in studies that show that people with Invisalign tend to enjoy better oral health. With so many benefits over conventional braces, it is little wonder that Invisalign is more expensive. However, many patients state that, for them, the advantages of choosing the newer solution outweighed the cost. Both braces and Invisalign have been shown to be very successful and our dentist will be happy to discuss your options with you and help you decide on the right orthodontic treatment. To schedule your consultation, please contact our offices.